It’s fascinating for me to think about the unseen connections between us. You walk past a person on the street not knowing that in two hours or two years s/he might become the most important person in your life. Or it’s the person who has already saved your life, or because of whom you’ve almost lost yours - without you knowing it. It’s not dramatic and it’s very real. This struck me the most when I´ve lived the story below. Admittedly it’s not a very amazing coincidence, at least not for my taste, but for sure it´s a quite remarkable and interesting one. Our kids were about 5 or so. By that time we were living out of our country, Romania - namely in Vienna / Austria. But we used to come „home” on holidays and special occasions, and also traveled the country as tourists. By that time we had no intention of ever un-emigrating, but did want that our kids know their roots, know that they are (real) Romanians, and what that means. 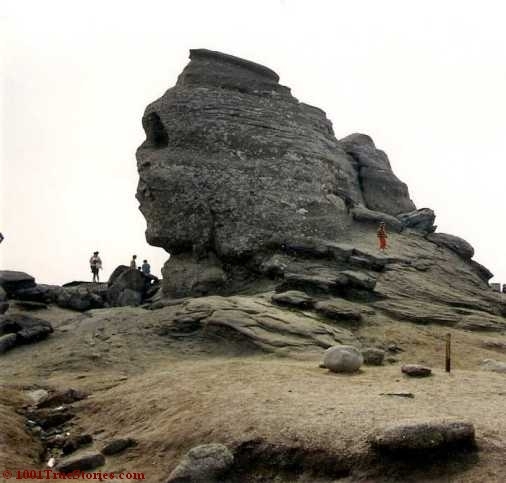 The Sphinx of Bucegi Mountains, carved by waters and winds, is one of the mysteries of Romania. 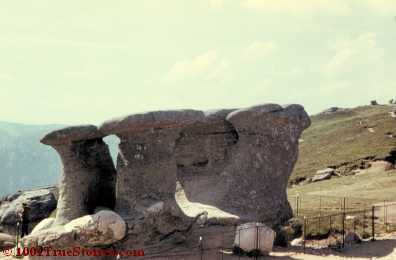 It stands at the crossing point of many various theories as to its formation, possible history, secrets and so on. 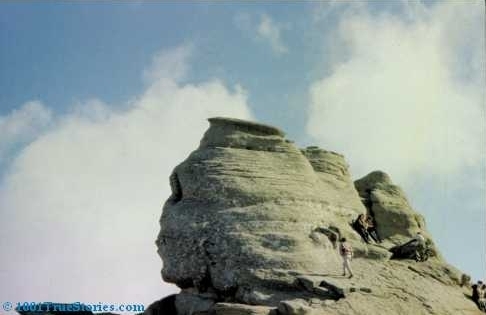 That summer we were in the Bucegi Mountains to show the kids the marvels there: the Sphinx, the Babele / Old Women Rocks (shaped the way you see them here by winds and waters), the huge Cross on Mt. Caraiman, the wonderful and somewhat eerie landscapes. We took a room in the town beneath all those and made one-day trips from there. Now, our room was a guest-room in the house of a Mrs. Ivanescu. We had reached there by absolute chance, asking people on the street who around had rooms to let. In one of our small-talks she showed us her kitchen. There were traces of smoke on the ceiling. She said, she was once watching TV and totally forgot that she had on the kitchen stove some prawn chips to deep-fry. She had simply put the chips in plenty of oil, lid on, and quickly back to the TV where it seemed to have become interesting. It was very much so indeed, because when she at last came again into the kitchen there was a heavy smell of over-heated oil. She raised the lid and fortunately did so with the lid toward her and the opening toward the window. A high flame burst out from the inside and the curtain (and then things around) instantly caught fire. She doesn’t want to think what would have happened if she raised the lid with the opening toward her. 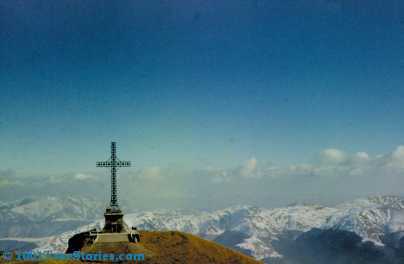 The Cross on Mt. Caraiman was raised by our former Queen Maria after WWI for fallen Romanian soldiers. 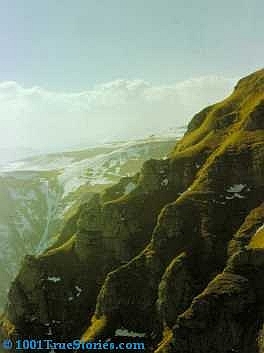 With almost 40 meters (+ 8 m the pedestal) it entered the Guinness Book as the world´s highest cross on a mountain peak. I instantly thought something and asked her "THE prawns? The thin chips getting swollen when deep-fried?” "Yes..." "Those in blue-creme colored box we used to have in the communist era?" "Yes!" "... And which had recently re-appeared on the market?" "Yes, you do like them also, aren’t you? ", she asked me feeling there was something beneath my questions. "No, I only happen to also know them... very well... even if I don’t like them." And thought I better stopped there. So, it was because of us, her guests of today, Mrs. Ivanescu’s clients, that she had once been so close to... Brrrr, I don’t want to think further. Well, I do too, but in the other direction. Why my brother was in Vienna in the first place? He was there because I was there. And I was there because Dietmar (the pilot from this other true story about amazing coincidences), had once upon a time taken the train from France to his home in Austria. The clerk at the counter in that French train station asked him on a whim whether he would be interested to stretch his route until Romania, since the price and the train were the same. Romania... Sounded pretty misterious and appealing to Dietmar. He accepted the challenge – and he became the person who helped us emigrating.